The festival of colours – Holi is just around the corner and Bhojpuri industry has been treating its fans with peppy and upbeat Holi songs. Each song has gone viral on social media and has clocked over millions of views in a short span of time. From Khesari Lal Yadav to Amrapali Dubey to Nirahua to Akshara Singh, all the big shots of the industry has crooned to the special Holi songs. Talking about the festival of Holi, this year Holika Dahan is on 20th March and Holi is on 21st March. People all over India have already started celebrating Holi with Gulal and bhujiyas. This festival is an ancient Hindu festival which is quite popular among non-Hindus and is celebrated with a lot of zeal and enthusiasm. Holi falls in the month of Phalgun and the festival is celebrated with lots of love, colour, food and friendship. Holi festival symbolizes good over evil. 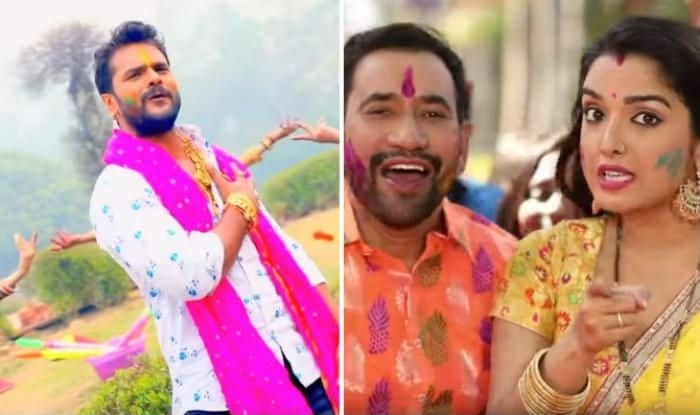 Bhojpuri superstar Khesari Lal Yadav and bombshell Priyanka Singh’s new Holi song titled ‘Kukura Chahet Dela’ is crooned by Khesari Lal Yadav and Priyanka Singh. The music has been composed by Ashish Verma and lyrics have been penned down by Pyaare Lal Yadav. Bhojpuri film superstar Dinesh Lal Yadav aka Nirahua and Amrapali Dubey’s new Holi song ‘Rajneeti Mein Rangail Pura’ has clocked over 1 million views on YouTube. The song is sung By Nirahua and lyrics have been penned down by Pyare Lal Yadav. Bhojpuri melodious queen Akshara Singh has released her new Holi song titled ‘Sakhi Ke Marda Udawlas Garda’. In the song, Akshara is seen dressed in a yellow saree teamed up with long braided hair, sindoor, a pair of earrings, bold lipstick and stylish aviators. Her swag is bang on as she sits on a bike. The song has been crooned by Akshara Singh and the lyrics have been penned down by Manoj Matlabi. The music is directed by Ghunghru Ji. Kajal Raghwani, Khesari Lal Yadav’s 2019 Bhojpuri Holi song ‘Bhatar Gaile Dilli Ho’ is a hit. he music of ‘Bhatar Gaile Dilli Ho’ is composed by Ashish Verma while the lyrics are penned down by Pyare Lal Yadav. In the song, Khesari Lal Yadav is dressed in a black kurta and red dupatta whereas kajal has Holi colours on her face, and has complemented her attire with kohled eyes and big jhumkas. The song has Akshara Singh as the lead and she has also sung the song. Akshara Singh is donning a light blue saree in the video. ‘Holi Mein FIR Karoongi’ is the story of a housewife and his drunk husband. She gets pissed off with him because he is drunk on the occasion of Holi. The song featuring Amrapali Dubey and Pravesh Lal Yadav has clocked over two lakh views and still counting. The song is sung by Amrapali and Pravesh. The music has been composed by Rajnish Mishra and lyrics have been penned down by Pyarelal Yadav.